These tasty meatloaf muffins are a nice change from the everyday meatloaf, and they're sure to be a hit with kids. One of the great things about meatloaf is its amazing versatility. It's easy to "hide" grated carrots or other vegetables in the meat mixture or sprinkle in some cheese when you add the ketchup topping. Meatloaf muffins can be served along with chips or fries—for extra fun, try putting them in small buns for meatloaf sliders! Heat the oven to 350 F (180 C/Gas 4). Lightly grease a 12-cup muffin pan or spray with nonstick cooking or baking spray. In a large skillet, heat the olive oil over medium heat. Add the onion to the pan and sauté until lightly browned and tender. Add the finely minced garlic and cook, stirring, for 1 minute longer. Combine the ground beef with the bread crumbs, 1/2 cup of the ketchup, the Worcestershire sauce, the beaten egg, thyme, oregano, ground black pepper, and salt. Add the sautéed vegetables, mixing until well-blended. Then pack the meat mixture into the prepared muffin cups. Bake the meatloaf muffins for 20 minutes. Top each meatloaf muffin with a few teaspoons of the remaining ketchup and return to the oven and bake for about 5 to 10 minutes longer. The meatloaf muffins should register at least 160 F on an instant-read thermometer inserted into the center of one. If the muffin cups are a little over-filled, put a rimmed baking pan or sheet of foil under the muffin tin to catch any overflow. 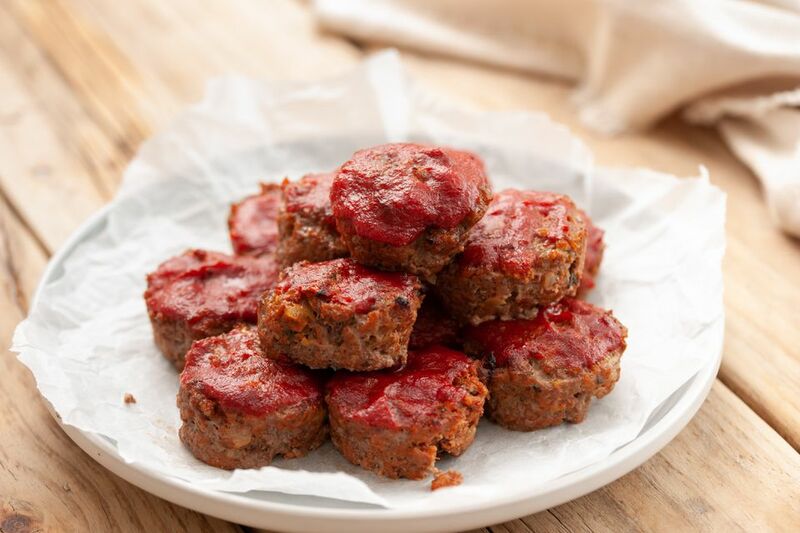 Make a big batch of meatloaf muffins and freeze them for future lunches or dinners. To do this, bake the meatloaf muffins without a topping. After baking, place the muffins on a baking sheet and move them to the freezer. When they are frozen solid, transfer them to freezer bags. Label with the name and date and freeze for up to three months. Reheat meatloaf muffins in a 350 F oven for about 35 to 45 minutes, or until they register 165 F (the minimum safe temperature for leftovers). Add a ketchup topping just before they are ready and enjoy!